On the occasion of the 25th Anniversary celebration and the XXI Session of its Presidency, the UNPO, with the support of Fredrik Malm MP (Liberalerna), will be organizing a conference entitled ‘Drivers of Peace and Democratisation: National Minority Rights and Diaspora Action’ at the Swedish Parliament (Riksdagen) in Stockholm, Sweden. This conference will take place on Thursday 28 April 2016 from 13:00 to 16:00 in the Nubiska Rummet room. Despite the fact that multi-ethnic states are the norm rather than the exception in today’s world, majority or dominant cultures continue to impose their identity on other groups with whom they share a territory. This often comes at the expense of national minority rights, especially in undemocratic countries where marginalization and assimilation policies are often being pursued under the pretext of safeguarding national security and territorial integrity. However, nations and peoples always have and will continue to seek expression of their distinct languages, cultures, beliefs and traditions. In this context, the protection and promotion of national minority rights becomes essential, as it not only prevents increased intolerance, but also has the positive effect of fostering a greater understanding among citizens of multiethnic and multicultural societies, and by extension contributing to democratisation processes. While community leaders, education, and the media play important roles in advancing the rights of marginalized groups, so do exiled political movements and diaspora groupings. With many in Europe now focusing on the major challenges unveiled by the current migration ‘crisis’, it becomes more important than ever to discuss some of the root causes pushing people to flee their homes, as well as how we can actively support various drivers of peace and democratisation. 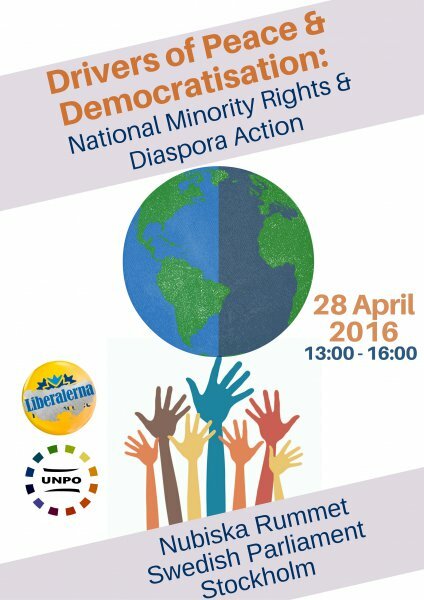 To this end, the Unrepresented Nations and Peoples Organization (UNPO), with the support of Fredrik Malm MP, will be organizing a conference entitled ‘Drivers of Peace and Democratisation: National Minority Rights and Diaspora Action’ at the Swedish Parliament (Riksdagen) in Stockholm, Sweden. This conference will take place on Thursday 28 April 2016 from 13:00 to 16:00, on the occasion of the 25th Anniversary celebration of the UNPO and the XXI Session of its Presidency.